Type B is defined as ‘structurally integral protection’ and the structure itself is constructed as an integral water resistant shell. A concrete structure is built which includes watertight concrete admixtures, hydrophilic strips/water bars (passive or active). When considering and/or specifying a Type B integral system, a clear knowledge of concrete construction is required to meet BS8102:2009 specifications. A robust strategy is to design the concrete in accordance with BSEN:1992 Euro code 3. The NHBC 2016 technical manual ‘Chapter 5.4’ states that a “dual system” (two waterproofing systems) must be incorporated to structures where a Structural Warranty is provided. Combination systems can be used for convoluted/difficult shapes to waterproof. 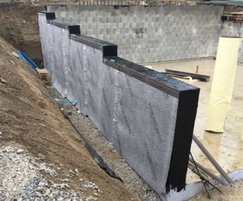 A liquid/cementitious (Type A) system can be lapped behind a Type C system, to provide continuity of the waterproofing design. Delta's Koster product range is suitable for Type A waterproofing and offers solutions to repair of Type B structures through crack injection to water stopping also to include curtain wall injection. Koster products work in harmony with Delta’s Type C Cavity Drain Systems and ensure a robust and watertight solution.